Do you have a best friend? I’m really starting to think that my Budget Binder is my best friend…kind of weird, I know, but hear me out. My budget binder has helped my husband and I pay off $54,500 of debt in under 2 years! It has helped us improve our finances in Every. Single. Way. It has helped us improve our marriage and it will help us continue to work towards financial freedom! Still sound weird? 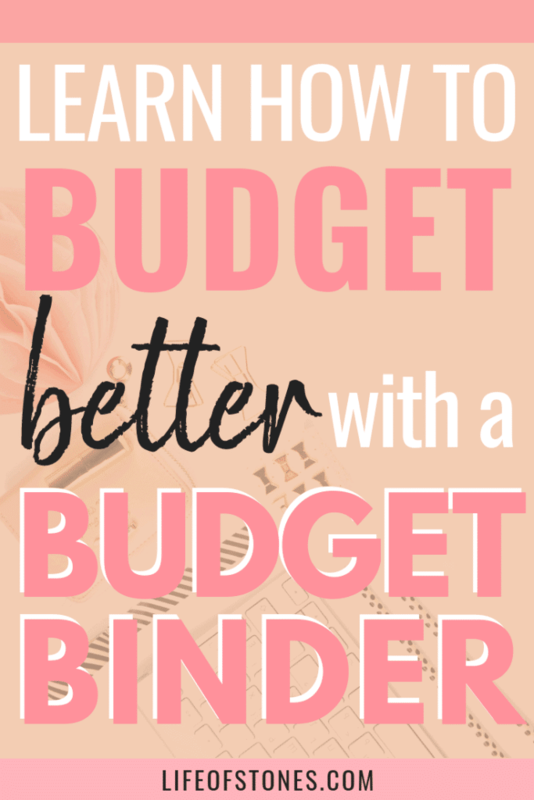 Ok, maybe a little, but trust me…you need a budget binder! Gone are the days of using just the simple checkbook register from the bank. And while yes, I know we are a digital society, I still love using good old pen and paper! I feel it gives me more control and helps me to really feel my finances more than if I’m simply reviewing automated info on a screen. Our debt-free journey began when we took this life-changing course and it taught us how to create a monthly budget. This budget offered us a freedom with our finances that we’d never experienced before. Sure, some months totally sucked… we messed up, overspent, forgot to include certain expenses and eventually, I realized that while the budgeting forms from that class were great, I needed something a bit more customized for our family and our specific needs at that time. We were in debt, had virtually zero savings and I had just begun a part-time job with a consulting firm. This was our opportunity to make some major changes and I didn’t want to screw it up…again! WHAT IS A BUDGET BINDER? I began to create my own charts and pages in an attempt to become more organized and set up a system for our family finances that would allow me to check myself each month to be sure nothing was double-paid or overlooked! I called it my budget binder and it became an integral part of my daily finance rituals, which included a quick check of my daily balances and posted transactions, a glance at my bill calendar to be sure all upcoming bills were paid and making any necessary updates to our savings! I knew I wanted to share this resource so it could benefit others as much as it had (and continues to) benefited us so I finally decided to open my own Etsy shop and offer my Begin to Budget Bundle as my first product! If you struggle with starting a budget check out my FREE Begin to Budget 5-day email course to help you get started learning how to budget. You will receive one email every day for 5 consecutive days walking you through the entire process of creating your own monthly budget you can actually stick to! You will even find a few of the pages from the bundle in my email course for free because I really want to help you get started the right way! The lessons included in the course are things we’ve learned along our journey to work through completing Dave Ramsey’s Baby Steps System. They have helped us complete Baby Steps 1 and 2 and we are now living debt-free except for our mortgage! This has made a huge impact on our lives in ways we couldn’t even imagine! It has improved not just our finances, but it has also improved our marriage by alleviating the constant stress and fighting over money! It has improved our parenting as we live more frugally and intentionally and are now passing these new habits along to our children and teaching them about money in ways we were never taught. It has improved our hearts. We are more charitable. We always wanted to give but felt that we didn’t have anything to give. Giving is now a priority in our lives and our finances and we intend on increasing our charitable contributions each year because we believe it is our duty to give back as we have been so greatly blessed! I started helping some people in my life with budgeting and getting their finances organized and they were giving me good feedback on the sheets I was printing for them so I decided to create an official budget binder I could offer to my readers as a resources so they, too, can use it as a tool to budget, pay off debt and save money! 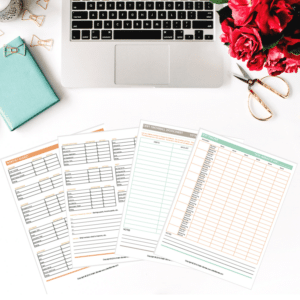 Introducing the Begin to Budget Bundle, 31 printable pages to help you budget, track your debt, savings and sinking funds and organize your finances! You’ll finally see where your money goes, which categories you spend the most in and create a monthly budget you can actually stick to! WHAT’S IN THE BUDGET BUNDLE? The Begin to Budget Bundle is an instant downloadable pdf – that means you download the file to your computer and print it as many times as you need! Once you have it, it’s yours forever! Everything is UNdated, so you can reprint and reuse for years to come, it will never be out of date! In the bundle, you’ll find blank monthly budgeting worksheets to help you create a zero-based monthly budget. This will ensure you give every dollar a name and your budget is equal to zero at the end of the month! These monthly budget worksheets can also be used to budget by paycheck if you prefer. In which case you would print two sets per month (or one set per paycheck). This method can often be easier when just getting started. To budget by paycheck (or the first half and the second half of the month) you would simply zero out all the expenses that are not occurring during that pay period or half of the month. You will also find yearly bill trackers to keep a wide-lens view of your paid vs. unpaid bills for the year at a glance in addition to checking and savings account ledgers. The teeny tiny ones from the bank just weren’t cutting it for me – I prefer the full page ledgers in my binder, which allow me to view large portions of my transactions at a time and keep my ledger with all of my other finance info together in one place! 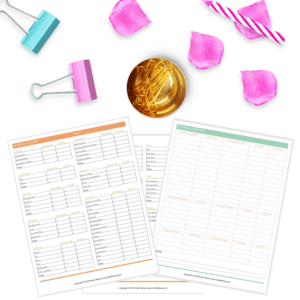 You will find printables to help you build and track your savings! Whether you’re working to save a starter emergency fund or you need help managing your sinking funds, you’ll find a page to help with all your savings needs! Many people set up multiple savings accounts for their different sinking funds but I prefer to dump it all into one major high yield savings account and just track our deposits and balances on their own sheets, almost like a ledger. I print out one tracker per sinking fund and it helps me stay organized and quickly see our progress in any one fund without having to constantly log in to our accounts! I filmed an entire YouTube video walking you through my entire budget binder setup! Of course, you can set your budget binder up in whichever way works for you! Your bill-paying and tracking workflow might be different than mine so be sure to organize it in whichever way feels most efficient to you! Remember, a budget binder is a tool to help make your life easier…not more complicated! So if something feels as though it’s not working well for you – switch it up! I like to divide my binder up by month and keep a calendar in each month (included in the bundle) where I fill in all paydays, bill due dates and any other expenses I’m aware of in advance. This helps me plan better when sitting down to prepare our budget for the month ahead! I also include a written budget (on the included budgeting sheets) as almost a “rough draft”, and I keep this in the binder under each month’s tab and usually get them out again during our monthly budget meetings! I’ll jot down notes on this throughout the month when needed and I’ll toss these at the end of the year! I’m still fine-tuning my process each month. Some months I’m feeling a bit more keen on the paper budget and some months I’ll feel compelled to work more in a spreadsheet budget (usually when I’m looking at the big picture and trying to project our financial goals). Your budget is a very personal thing and unique from anyone else’s. Regardless of which method you choose to budget, I am here cheering you on! 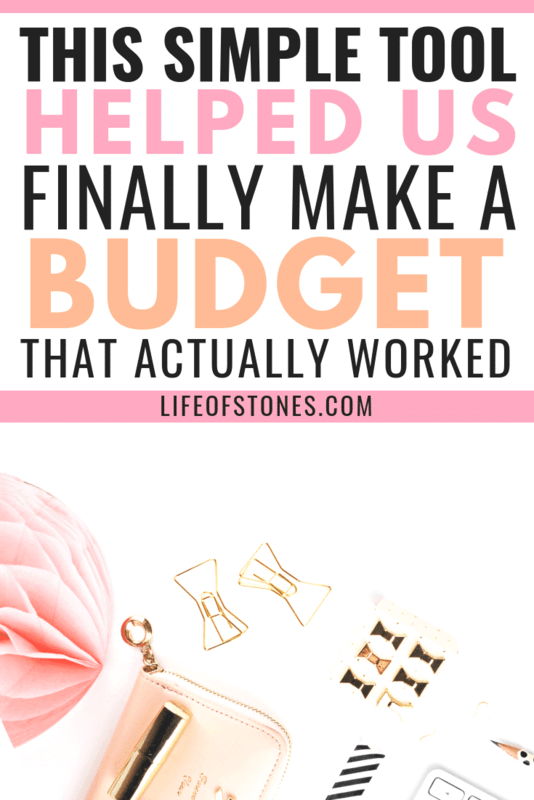 I know what it feels like to try to budget many times over, and fail…many times over!! But each time you have to get back up and try again. If financial freedom is important to you (and it should be) then you owe it to yourself to keep trying until you get it right! 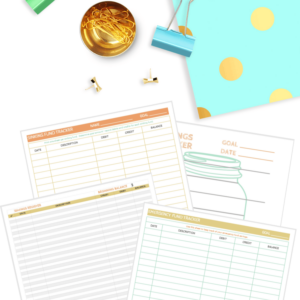 And if paper + pen(cil) just isn’t your jam, check out my new Simple Budget Spreadsheet Template to help you manage your budget digitally!